Barack Obama. . Wallpaper and background images in the 刺猬索尼克 club. This 刺猬索尼克 photo contains 商务套装 and 西装. There might also be 精心打扮的人, 西装, 裤套装, 裤装, 穿着好衣服的人, 裤子套装, 穿得好的人, 套装, 标志, 海报, 文字, 黑板, 文本, 衣服套装, 套装, 西装, 衣服, and 套衣服. Wow, Everyone! 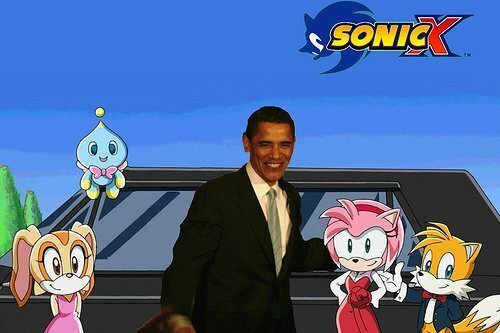 Instead Of Sonic, There's Barack Obama With Cheese, Cream, Tails And Amy. and it looks like he has his arm around Amy XD... *thinks of new couple Obamamy* O_o.. I don't really like him... Sorry but... SHADOWS OR SONIC IS WAY BETTER!!! Shadows awesome!